Taking up where the previous Brad Lansky title ended, this drama has Brad and Alex exploring the 4D-Verse. They get split up while searching for MAMAI (an artificial intelligence), with Alex moving to a higher dimension while Brad figures how to get him back. In a previous review I compared a Brad Lansky audio to Meatball Fulton’s Ruby series. This one comes from the same mold. It’s a aural feast from start to finish; among the richest audio you’ll hear. Another comparison leapt to mind this time: the film 2001: A Space Odyssey. Not only is the subject matter similar (hard SF involving alien beings), but the tone is similar. Just like Kubrick lingered on shots to allow the viewer time to experience awe, Dieter Zimmerman and crew linger with sound that creates images in the listener’s mind. This is very much a cooperative experience. Break out your best headphones and be prepared to provide imagination. Lansky: I can’t wait to check out these places! Alex: What? Are you crazy? Lansky: No, just an explorer who doesn’t run away when he finds something interesting! Dieter Zimmerman, one of the creative people behind the Brad Lansky series, was recently interviewed on Fred Greenhalgh’s Radio Drama Revival podcast. Find that episode |HERE|. 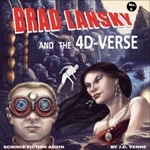 All of the Brad Lansky titles can be purchased at Protophonic.net!